One of the most common principles of investing is to spread out portfolio risk by diversifying investments across different asset classes. Naturally, the objective of finding the most appropriate asset allocation is driven by an investor’s desire to accumulate and maintain the level of wealth needed to meet their goals. For many years, two of the most popular asset classes considered by investors have been stocks and bonds. Historically, there’s been a common perspective that as one becomes older, it would be wise for them to adjust the risk in their portfolio by decreasing the amount of stocks and increasing the amount of bonds they own. Future economic cycles will never perfectly replicate a prior cycle, and market conditions will continue to evolve. Therefore, the way we manage portfolios must also evolve by trying to find nontraditional ways to achieve attractive risk-adjusted performance. Correlation can be defined as the degree to which two securities or asset classes move in relation to each other. Although bonds tend to be less volatile than stocks, there have been several periods in history where the two asset classes have exhibited a higher than average correlation with each other. Figure 1 above displays the correlation between equity and bond returns from 1958 to 2018. As correlation stands above 0 and approaches 1, this means that stocks and bonds are trading in tandem. As it stands below 0 and approaches -1, it shows stocks and bonds are trading opposite of each other, thus diversification between the two asset classes is working well. Note, the decades of elevated correlation from the mid-1960s to the mid-1990s. During these periods, the higher-than-average correlation likely played a factor in driving up the volatility in portfolios. Over the years, investors have turned to bonds to play a capital preservation role in their portfolios. In the event bond values decline at the same time as the stock values, one of the most important tenets of diversification can be considered compromised. 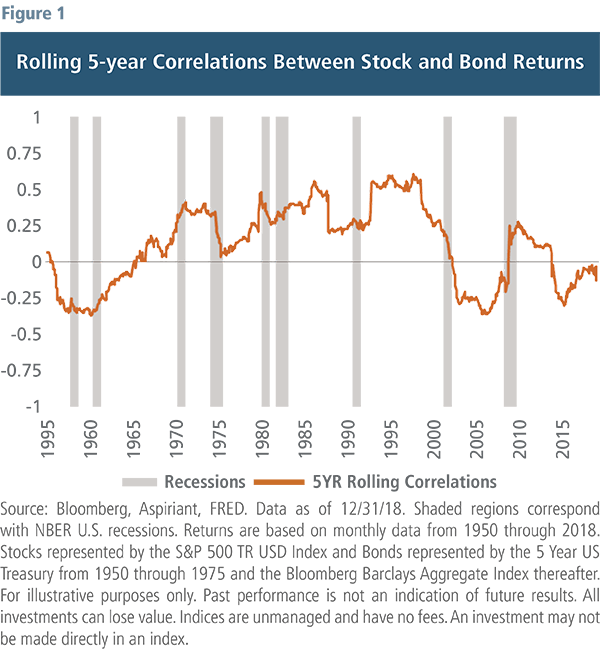 In fact, stock and bond correlations have historically been higher during recessions (+0.15), which is when you most need diversification working for you. During periods of high stock-bond correlation, diversifiers can be a great source for smoothening returns and dampening portfolio volatility. Diversifiers, as the name may suggest, are investments that provide exposure to assets that tend to behave differently from traditional stock and bonds. These investments can help improve the risk-reward characteristics of a portfolio — that is, offer investors the potential to earn a higher return per unit of risk — because they are less correlated, earning cash flows from different sources. For example, a commonly used diversifier strategy is merger arbitrage — an event-driven way of investing which involves exploiting market inefficiencies before or after company mergers. The opportunity in this strategy arises from the notion that the stock price of a target company usually remains at a discount below its acquisition price, expressing uncertainty around the merger closing. For an investment manager, there’s opportunity to purchase shares in the target company and capture the returns once the deal closes. A market neutral strategy is another useful tool that aims to produce returns independent of the overall market performance. This is accomplished by making equally sized investments in both long and short positions, meaning you have exposure to investments that can generate returns when prices go up and when they go down. The success of this strategy is determined by the investment manager’s skill, or their ability to successfully identify long investments that appreciate and short investments that depreciate. The market neutral approach aims to benefit from the fact that there can be companies or industries that perform poorly (or well) in strong (or weak) macroeconomic environments. Because this strategy doesn’t rely on the performance of global equities or bonds, it produces a diversifying effect that can stabilize the risk in an investor’s portfolio. In our recent article, Understanding Risk and Volatility, we introduced a story around two friends, Alex and Bill, who competed in an archery contest. In a new scenario, let’s assume Alex and Bill are taking a vacation and plan to set sail from California to Hawaii, but each decides to take separate routes. Bill’s route can be described by his more traditional investment portfolio allocation: 70% stocks and 30% bonds. Meanwhile, Alex mapped a course that’s 60% stocks, 20% bonds and 20% diversifiers. 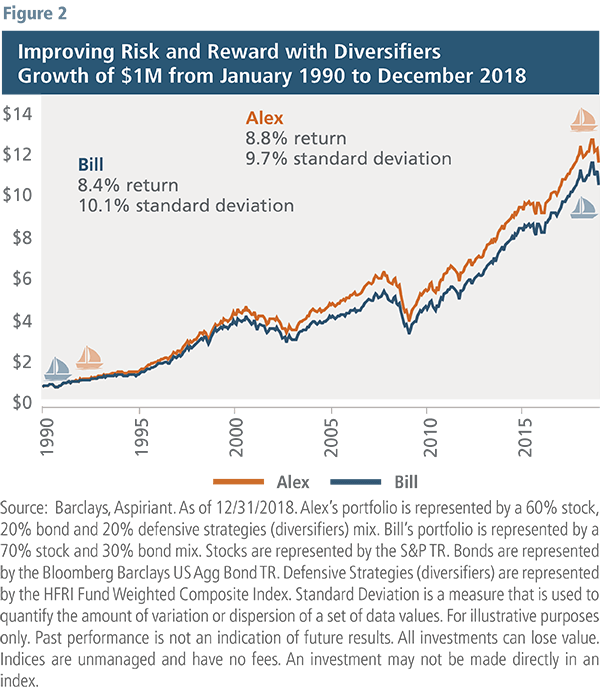 As you can see in Figure 2, by using diversifiers in his portfolio, Alex was able to reduce the impact of market volatility, thereby avoiding some of the turbulence that Bill experienced and earning slightly higher returns. While we all want higher returns in our portfolios, there’s great value in the predictability of returns as well. We discussed earlier decreasing the amount of risk in our portfolios as we age. If investors could also have a little more certainty around portfolio performance, it could help reduce short-term market anxiety. Figure 3 above exhibits annual returns from left to right, and best-performing asset classes from top to bottom. 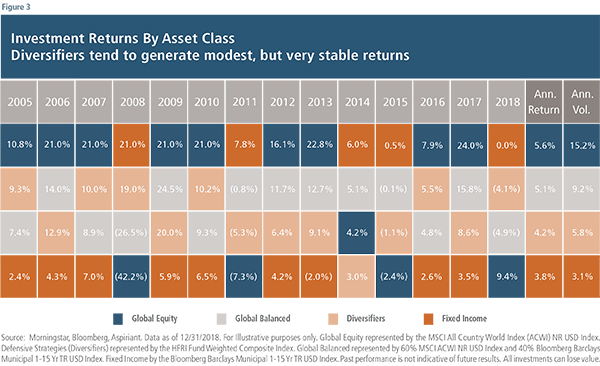 Since 2005, diversifiers have only been the worst performer once (2014) and have never been the best-performing asset class. They’ve managed to remain in the middle of the pack — never getting too high or too low. This is invaluable when added to portfolios, especially considering that bonds may not generate sufficient return, and equities can experience massive selloffs. It’s also evident that no particular asset class wins every single year. This is why diversifiers play an important role — they complement market fluctuations by reducing volatility while still enhancing portfolio returns.